I recently helped fund a Kickstarter project for an Organic LED (OLED) display and breakout board. This was design and built by ILSoft, an electronics and software company based in Tyne and Wear, UK. I had been interested in using an OLED display for some time, as they have a good contrast ratio and quite a good resolution. This makes them good for viewing small details in different light conditions (potentially where an LCD might not be suitable). This board recently arrived in the post and I wanted to check it out and get it up and running. 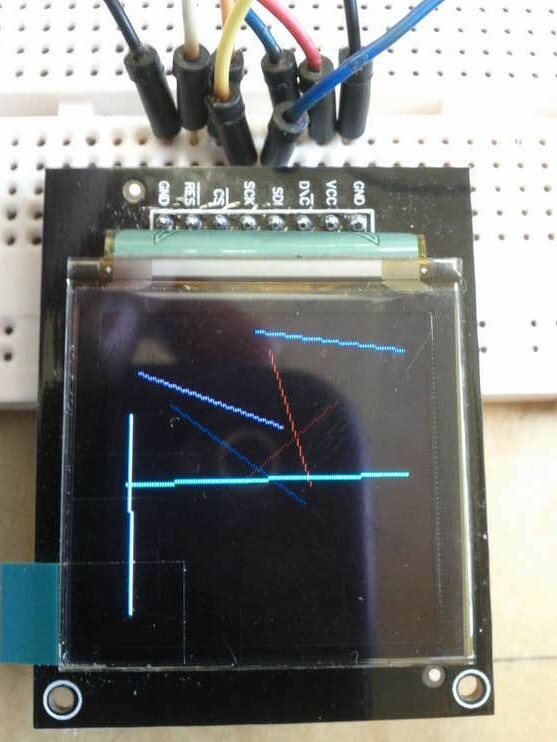 This is a post on my first very basic tests getting the display to work with an Arduino. I downloaded the example code from ILSoft GITHUB pages. These were uploaded into my Libraires folder within my Sketchbook. This worked to give me the example outputs which looked pretty, but were pretty basic. I wrote a quick test routine which drew random lines in random colours (check the end of the post for the code). This shows off the capability of the screen pretty well, although it looks like a mess after a minute or so. 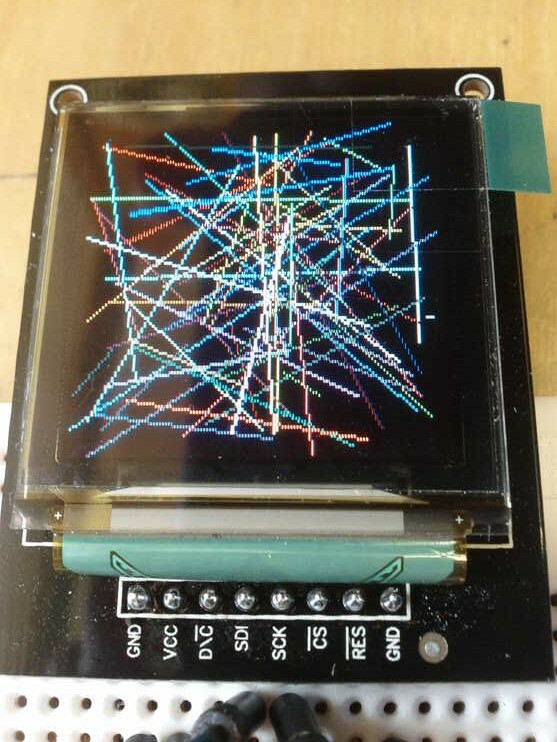 Drawing random lines within a 128 x 128 display with each line as a random colour. Eventually its a mess – but fun. Here is is Arduino code. You need to download and install to your libraries folder the OLED library from ILSoft for this to run. 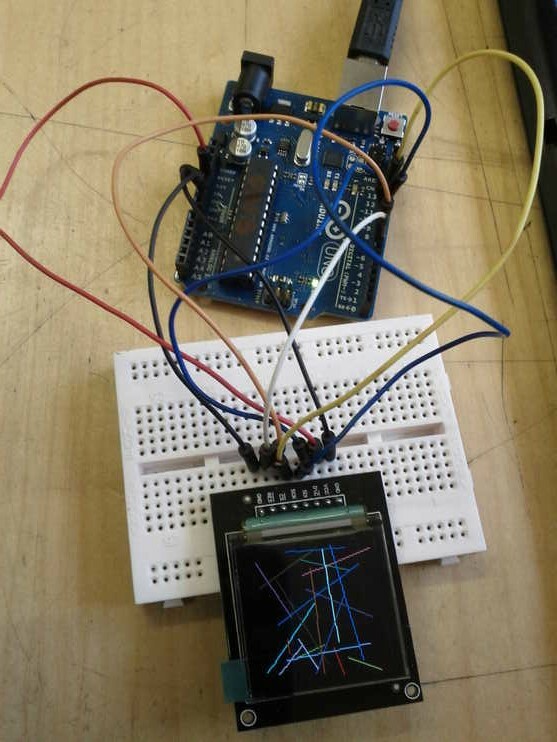 This is a simple testing routine to draw a whole load of random lines on the OLED board from ILSoft. Please see www.re-innovation.co.uk for more details. // The Arduino Shield from ILSoft uses pins 8, 9 and 7 for CS, DC and Reset. 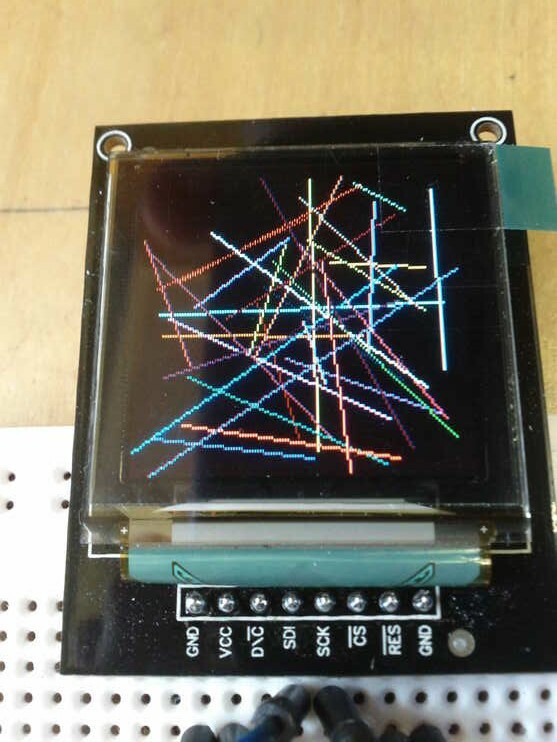 // Create a variable to hold our OLED class. // Instantiate the class with the pins. // Draw a line between two points with the colour Red.